Scars, which are made mainly of collagen (a protein fiber normally found in the skin’s second layer), are the body’s way of repairing itself. Acne scars are typically indented because of collagen loss from intense inflammation. Picking leads to further inflammation and injury of the skin, which adds to the skin’s discoloration and scarring. Squeezing or trying to pop a pimple causes pus and bacteria to filter deeper into the skin, resulting in more collagen damage. If your acne scars don’t fade away on their own, it may be time to consider to see your doctor. -Ice pick-shaped, which are narrow and deeper. 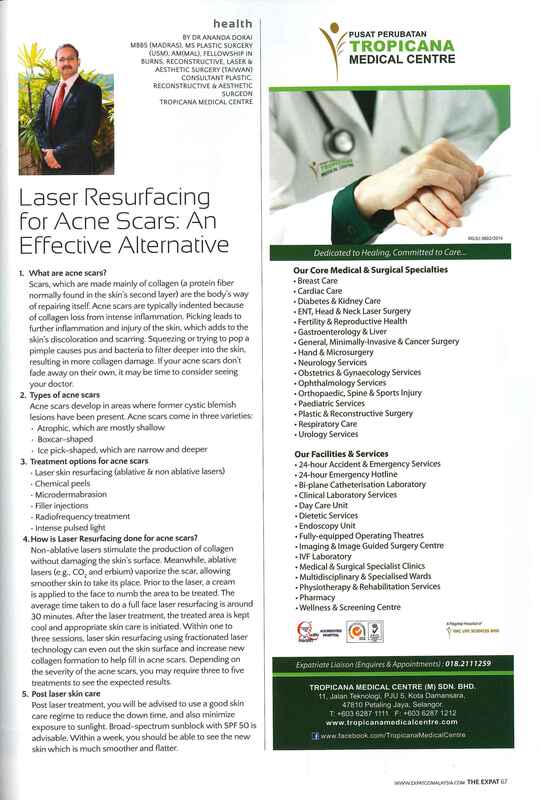 How is Laser Resurfacing done for acne scars? Non-ablative lasers stimulate the production of collagen without damaging the skin’s surface. Meanwhile, ablative lasers (i.e. CO2 and erbium) vaporize the scar, allowing smoother skin to take its place. Prior to the laser, a cream is applied to the face to numb the area to be treated. The average time taken to do a full face laser resurfacing is around 30 mins. After the laser treatment, the treated area is kept cool and appropriate skin care is initiated. Within one to three sessions, laser skin resurfacing using fractionated laser technology can even out the skin surface and increase new collagen formation to help fill in acne scars. Depending on the severity of the acne scars, you may require between 3 to 5 treatments to see the expected results. Post laser treatment, you will be adviced to use a good skin care regime to reduce the down time and exposure to sunlight is avoided. Broad spectrum sun block with SPF 50 is advisable. Within a week you should be able to see the new skin which is much smoother and flatter.